For a while now the groups of residents seeking to close the Santa Monica Airport have been counseling caution in dealing with the Federal Aviation Administration (FAA). The City of Santa Monica was so bruised by losing its case against the FAA over big corporate jets that the groups, the chief of which are Community Against Santa Monica Airport Traffic (CASMAT) based largely in the Santa Monica neighborhoods of Sunset Park and Ocean Park, and Concerned Residents Against Airport Pollution (CRAAP) based largely in the L.A. neighborhoods of Mar Vista and Venice, proposed strategies and tactics that — t’ai chi ch’uan style — avoided a head-on clash with the FAA. The FAA’s train was a covenant in a 1948 “Instrument of Transfer” by which the federal government released its wartime interest in the airport; the covenant on its face required Santa Monica to operate the airport in perpetuity. In all the decades of litigation over the airport the feds had never tried to keep the airport operating by invoking this clause, but a few years ago — getting desperate? — FAA administrators grabbed hold of the covenant and threatened Santa Monica with dire consequences if the city tried to close the airport in 2015, after the city’s agreement to keep the airport open until then, contained in a 1984 Settlement Agreement with the FAA, expired. In the t’ai chi philosophy of martial arts one defeats one’s foe by yielding and “sticking” to them rather than opposing force with force, and in true t’ai chi fashion the tactics of the anti-airport groups involved two gambits. One focused on a parcel of land, called the “Quitclaim Parcel” because the City obtained it by way of a quitclaim deed from the federal government in 1949, which was not covered by the Instrument of Transfer, and the other on the leases to aviation companies at the airport that expire in 2015. The tactics were (1) that the city would take back the Quitclaim Parcel, which would reduce the airport’s runway from 5,000 to 3,000 feet and preclude big corporate jets from using the airport without directly challenging the “perpetuity” covenant, and (2) that the city would simply not renew the aviation leases, thus drastically reducing the functionality of the airport. Although I had several times written in my Lookout column that the airport should close when the 1984 Settlement Agreement expired, I didn’t get to know the people in the anti-airport groups until I ran for City Council in 2012. I met them during the campaign, and what impressed me about them from the start was how practical they were. It’s easy for residents to make demands on the city without always considering legal, economic and other realities, but the anti-airport groups never took anything for granted. They researched everything about the airport, from its history, including the legal history of each parcel that makes up the airport, to operations — such as analyzing flight data to reveal that about half of all takeoff and landings at the airport came from flight schools that operated out of leased city-owned buildings. Then, knowing that fighting the FAA in court would be expensive and grueling, they came up with their strategies based on the Quitclaim Parcel and the leases. They demanded action from the City, but the actions they demanded were measured and cautious. Well, blow us all away, but forget yielding and sticking. 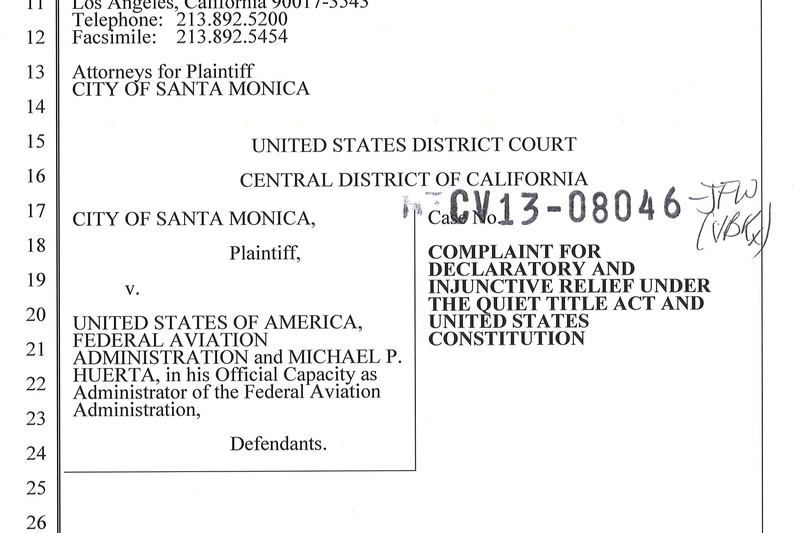 Last Thursday the City of Santa Monica went to battle against the FAA more like Marines landing on a beach. As I’m sure readers know, the City filed suit against the FAA seeking to quiet title on the airport land, asserting, among other arguments based on the language of the documents and, in some cases, the FAA’s own policies, that the perpetuity covenant in the Instrument of Transfer violated the City’s constitutional rights under the Fifth and Tenth Amendments of the Bill of Rights. If you haven’t read the Complaint, I urge you to do so. It’s written in plain, non-legal language. The arguments based on the facts — and I can’t wait to read the legal briefs supporting them — are powerful. A few things are clear. The City — and that includes the council members, City Manager Rod Gould and his staff, and City Attorney Marsha Moutrie and hers — not only listened to the community groups, but also studied the history of the airport they and others (notably environmental lawyers at UCLA) had unearthed. As a member of Airport2Park.org and looking forward the great park the City will build at the airport, I’m thrilled by the bold action the city took. But I also want to mention that the city’s complaint preserves the city’s rights to take back the Quitclaim Parcel (which it explicitly clarifies as not coming under the Instrument of Transfer) and terminate the airport leases. In a future post I’ll go into the complaint in more detail, but for now — Bravo! I am concerned that the Feds will bring “eminent domain” (see http://en.wikipedia.org/wiki/Eminent_domain) into this matter. What can the City of Santa Monica and the sorely affected citizens of West Los Angeles do to counteract that kind of legal action? John — the value of the land is, conservatively, $2 billion — that’s w/ a “b” — and I suspect it’s unlikely the Congress will agree to spend that to keep SMO running. Can the refusal to renew the leases be challenged as going against the obligation to operate the airport? Fred — good question. I suppose we’ll find out . . . The lawyers we at A2P have talked to think the answer is no, because the leases fall w/in the city’s powers as the proprietor. So I feel good about it, but I suspect the FAA will make that argument. Ken, I agree. What can we do now to make sure the development obsessed city council does not turn the last open space into Playa Vista? Have city council members made any commitments to keep the airport as open land? Why would they not do what they’ve done to downtown? Thanks. FYI – Besides several hundred Los Angeles members CRAAP has several hundred members that are Santa Monica residents. CRAAP was founded in the summer of 2003 as an umbrella group for all impacted residents. Also, I would not say that I am excited, but I am encouraged by the Council’s lawsuit. I’ll reserve getting excited for when the airport is closed and downwind airport neighbors can breathe air void of toxic jet emissions. Do we have an ordanance or Law or some successful citywide legal initiative that codifies a park in the plan. Please show me. For sure we are in trouble without a clear objective spelled out.